We have come to the midpoint of the Lenten season. As we continue to journey with the Lord to Calvary, we see that Easter Sunday is not that far off the horizon. Today is traditionally known as Laetare Sunday, which is a Latin word meaning rejoice. We rejoice that from the cross of Christ comes his victory over sin and death. You will notice today that the priest celebrating Mass will be wearing rose colored vestments. The rose comes from the mingling of the violet color of Lent and the white of Easter. It is a sign that the light of Christ begins to illumine our hearts during this time of penitence. Our gospel passage today is a familiar one, that of the Prodigal Son. We see how the father of these two sons shows mercy, love and compassion, even to the wayward son. God our Father loves us so much that he sent his Son Jesus to free us from our waywardness! These weeks of Lent are meant to prepare us for the celebration of the Paschal Mystery. We must do so with loving and forgiving hearts, filled with mercy and compassion. We will have Eucharistic Adoration and Solemn Vespers (Evening Prayer) each Tuesday evening during the season of Lent. All are invited to join us this Tuesday, April 2 at Our Lady of Victory Church for Vespers beginning at 7:30PM. Stations of the Cross are prayed throughout the Fridays of Lent at each of the three churches beginning at 7:00PM. Praying the stations of the cross is a beautiful Lenten practice of walking with the Lord on his road to Calvary. We have begun the 2019 Annual Catholic Appeal. As Pastor, I thank each of you who have participated with a gift to the 2018 Appeal and ask that everyone prayerfully consider making a gift to the 2019 Appeal. The work and services made possible through your donation to the Annual Catholic Appeal help people in Brooklyn and Queens in ways that no one parish can alone. 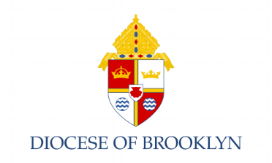 As you know, each parish throughout the Diocese of Brooklyn is given a financial goal to raise throughout the year. Our goal for the Annual Catholic Appeal this year is $59,586. This goal can be reached if everyone participates in the Appeal. Please remain assured that your gift to the Annual Catholic Appeal cannot be used in the settlement of abuse claims or for anything other than their intended purpose. Next week, we as a parish community will be able to view this year’s Appeal video and conduct an in-pew pledge for those who have not yet made one. Thank you for your support and generosity.